Safe House has lots of things going for it: excellent actors, especially Denzel Washington, Brendan Gleeson, Vera Farmiga, and Sam Shepard. And Ryan Reynolds does a convincing turn as fairly-innocent-guy-in-over-his-head. Rubén Blades and Joel Kinnaman (the creepy partner from AMC’s The Killing) do excellent work in small roles. Set in the sun-bleached streets of Capetown, South Africa, the movie has a fresh look, too. But that’s about all it’s got going for it. I expected the cinematic version of time-release testosterone, but every move is so predictable that The Sleeper had a good long nap. And when she woke up, she hadn’t really missed all that much. Me, I spent much of the movie wishing I were watching a rerun of Sky1’s Strike Back. Denzel plays a notorious and gifted rogue spy named Tobin Frost (that’s right, Jack’s evil twin). Frost has something all the good guys and bad guys want. What is it? Does it really matter? The most interesting element in the movie is the way he transports it—in a capsule under his skin, suggesting all kinds of interesting scenes that never made it into the movie (“Is it here? Or over here? Or perhaps right . . . here!”). He extracts the capsule so soon after injecting it that you wonder why he bothered in the first place. Ryan Reynolds is Matt Weston, an over-qualified CIA functionary whose job is to oversee a safe house in case it should ever be needed. Then Denzel’s character is brought in, and all h-e-double-hockey-sticks breaks out. Tobin Frost is the opposite of George Smiley, the plodder who seems to some of his colleagues to be barely able to keep up with events. Denzel’s character is like a chessmaster who sees thirty moves ahead. He’s amused by it all, even—and maybe especially—when the guns and bombs start going off. At one point, he even says, “I like games.” Denzel’s always fun to watch, and never moreso than in the first half of this movie, where he rearranges the furniture inside Weston’s head. 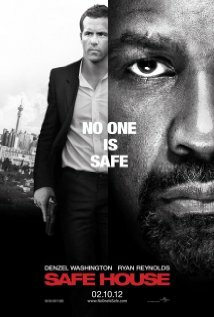 But when the shooting starts, Safe House plays out like a hundred others movies: gun fight, car chase, exposition, gun fight, foot chase, exposition . . .
And oddly, for a movie that’s mostly chase scenes and gun fights, it all feels fairly tame. That’s because it doesn’t bring anything new to the table. But it’s also because of the way it’s filmed. Much of the movie is shot with a narrow depth of field, with lots of close-ups of bloody, sweaty faces against blurred backgrounds. And most of it’s shot in the jitter-cam style. The goal is to ratchet up the tension. But frankly, if you used this style to film two octogenarians having tea, the resulting footage would look just as tense. The plot—like so many other thrillers of recent vintage—is recycled from Three Days of the Condor. Yes, once again we learn that the most dangerous enemy is within. And once again we see a talented amateur (or quasi-professional) take on a shadowy enemy that may or may not be the very people he works for. And what happens to the macguffin in Safe House exactly reflects what happens to it in the much edgier Condor. Here’s a thought: why not go back to the days when movies were made by writers, directors, and actors instead of by stunt arrangers, armorers, and cgi techs? P.S. Has anyone else noticed that recent action movies and thrillers have changed the sound effect for handguns? A Glock is essentially made of plastic, but when a movie Glock goes off, you hear the snap-and-clang of what sounds like a 50-caliber machine gun. Author Brent SpencerPosted on February 25, 2012 February 25, 2012 Categories ReviewsTags Brendan Gleeson, Denzel Washington, Ryan Reynold, Safe House, Sam Shepard, Vera Farmiga1 Comment on Safe as Houses? Have you noticed that Jake Gyllenhaal always has the tiniest of smirks in the corner of his mouth, no matter how serious, tragic, or life-threatening the scene he’s playing? It’s as if he can’t forget that the camera’s on him, as if he’s saying to himself, “I’m in a movie! 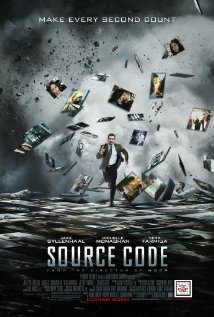 This is so cool!” If you’re not convinced, see Source Code, a capable thriller where the only time he loses that tiny smirk is when they use an animatronic version of his head and body. At least I think it’s animatronic. If it’s not, I have a message for you, Jake: “Stop dieting! You’re thinning out way too much!” Watch the movie—you’ll see what I mean. One of the great problems with many science fiction movies is the amount of time and attention given to explanations about how the future—or the alternate reality—works. I’m a big fan of the first Matrix, but remember that drawing room scene early on, in which Laurence Fishburne’s character explains the nature of the Matrix to Keanu Reeves? It’s endless and terrifically boring. The only active thing in that scene is the camera, as the Wachowskis sail it around the room Fincher-style in order to give the impression that more is going on than actually is. And in the sequels, that tendency to explain, to pontificate—that effort at what Anton Chekhov called “philo-wisdomizing”—just grew and grew, which is why the sequels never did as well as the original. But one of the things that makes Source Code a better-than-average sci-fi thriller is the absence of all that explanation. The movie starts in the middle of things. (Didn’t some ancient smarty-pants once recommend that?) Our man Jake is sucked out of a terrible train crash only to appear in a dingy capsule that looks like the inside of a giant’s crumpled-up TV dinner tray. From a monitor, Vera Farmiga takes the dazed Jake through a sequence of mental tests meant to bring him back to full (but not too full) awareness. It turns out that scientists have found a way to send a person back in time, but for just eight minutes a pop. A terrorist has bombed a Chicago commuter train, just the first of many planned bombings. The scientists hope that injecting Jake into the past just before the bombing, will allow him to discover the bomber’s identity, making it easier to catch him. And by the time we join the story, they’ve been sending poor Jake to the past for two long, unsuccessful months already. It’s Groundhog Day with terrorists. Yes, it’s a time-travel movie, the most shop-worn tool in the sci-fi writer’s toolkit. But with a difference. This time out, the plan is not to alter the past, only to get information in order to avoid the future (the planned bombings). On second thought, maybe that Jake-smirk is important to the plot, which depends on our hero learning a devastating truth about his condition and doing the right thing anyway. That little fishhook smile is a good indicator of a character who hears the worst news, adjusts, and carries on. There are secrets within secrets in this movie, and the success of the high-tech project at its center depends on Jake not-knowing how things work. That’s an original touch. Yes, secrets slip out in well-timed moments of revelation, but even then, the point is not the revelation itself but how the character responds to it. Even so, scary-good actors of his generation like Ryan Gosling and Ben Foster have nothing to fear from our man Jake in the talent department. Another nice turn in the genre is the casting of the mad scientist behind it all: Jeffrey Wright is more natty than nutty, spending more time on his hair than on threatening our hero. And Michael Arden plays the terrorist as a smug, self-satisfied nerd, not the wild-eyed fanatic we expect. The effect is chilling. And the talented Vera Farmiga turns a role that could have been nothing but a face on a monitor into something much more. With little more than her eyes and facial muscles, she conveys the changing awareness and sympathy of her character. Michelle Monaghan plays the love-interest whose eager for Jake’s character to ask her out. She’s never too bothered that he’s constantly distracted as he tries to find the bomber and his bomb in eight-minute snatches. Hint to the lovelorn: if the guy on the train spends all his time beating up fellow passengers, yanking their bags out of their hands, and digging around in air ducts and behind security panels, he’s probably not the right guy for you. Source Code is a far cry from The Matrix, Blade Runner, and even Groundhog Day, but you won’t leave the theater wishing you could go back in time to retrieve your ten dollars.